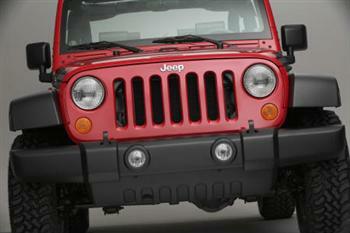 The Jeep Willys Wagon...Alive in Mexico! 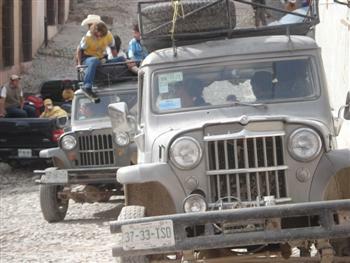 The Jeep Willys Wagon is alive and in full service in a remote town in North Central Mexico. Not only one...but a fleet of these old station wagons are being used like taxis and tour vehicles. Pretty fantastic, huh? How did I find out about this? 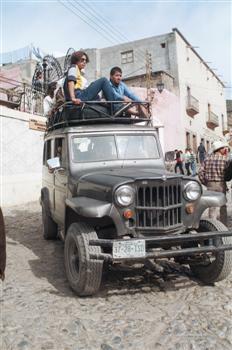 Well, some time ago in one of my newsletters I sent out a call for any stories or personal experiences with these Willys/Jeep Wagons..and this is what I got from a true Jeep Lover who had made a trip to the unique town of Real de Catorce, Mexico. Anyway I drove south of the border, to spend New Years this last December, with my lady friend in my '95 Jeep XJ Cherokee Sport (there is a shot of it coming up those 8 ft. wide mining roads) to the town of "REAL DE CATORCE" in the state of San Luis Potosi, Mexico. In order to come into the town of "REAL" (the only in and out entrance) cars and trucks have to take turns through a one-way narrow mountain tunnel, (2 kilometers or 1.24 miles long) being managed by two phone operators at each end of the tunnel..NO FEE necessary!! This was an old mining town booming with 35,000 people in the 16 and 17 hundreds, mining silver and sending it back to Spain. 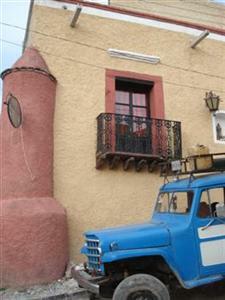 The town came down and mines were closed at the beginning of the 1910 Mexican Revolution. It lay forgotten for many years and now REAL is a nice laid back town with Europeans, quaint little hotels from restored dwellings and nice spicy restaurants. This town was the main set for a Movie of some years back "The Mexican" with Julia Roberts and Brad Pitt. 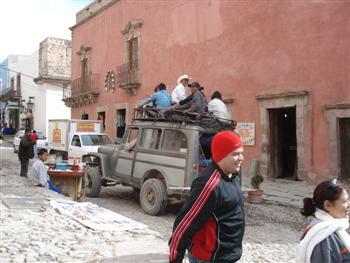 From then on, REAL has come to life and Mexican vistors and foreigners are flocking there for weekends and holidays. 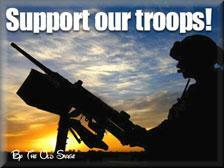 Enough said about REAL, and now here is the visual story. 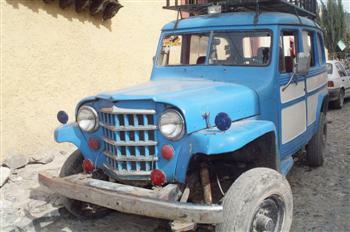 Old Jeep Willys Wagons are there and come to life, to drive visitors through the town and the mines nearby. From the pics you can see them, according to the locals, in good shape to climb those steep roads...but NO safety precautions are taken into account for those who hop inside, or on top!! 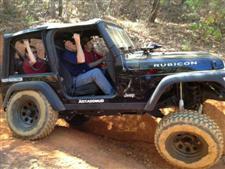 This is quite a "jeepy" adventure!! And whether tires being slick or suspension hitting you like a hammer on your back during the ride, visitors do come to enjoy these Jeep Willys Wagon trips. The local driver mentioned that these Willys Wagons were purchased , in the beginning, by PEMEX (Mexico's government owned oil) around the beginning of the 1950´s for oil prospecting crews in northern Mexico...There is a whole fleet of about 8 of these at REAL. This goes to show that Jeep engineering is alive and well and still kicking around...in the dusty roads of Mexico...and they are not for sale no more!! p.s. 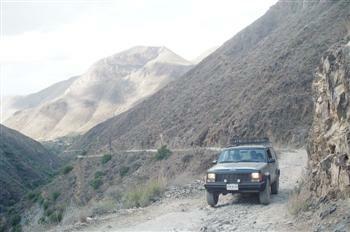 Perhaps we can have some other Jeep Lovers visit this town of REAL in Mexico sometime...More information about REAL can be found on the web at: ...www.realdecatorce.net Info is in Spanish, English, and Italian..And lot´s of photos too!!! 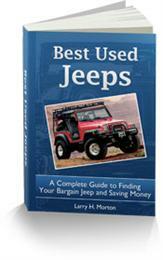 Do you own a Willys Station Wagon..or have a story about these great old rigs?..then tell us about it ..click now!